"Respect existence or expect resistance." I'm so proud of my daughter for demanding to be heard, focusing on the positive, staking her claim. Respect, reflect, resist. This is not the time to sit idly by. Our actions as parents, teachers, and friends matter. 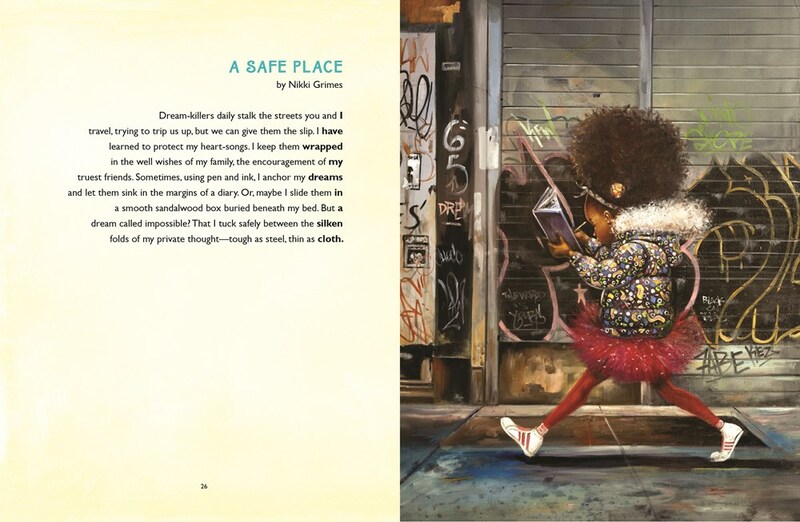 I believe deep in my heart that books can change lives, that stories bring awareness and empathy, that feeling heard leads to wanting to listen. I am proud to work for a school district that protects all students' rights to attend public school, and has a board policy protecting undocumented students. 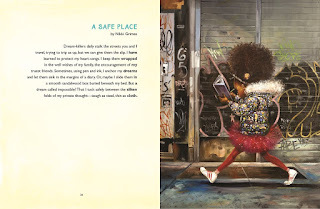 Here are some books I recommend sharing, that help readers understanding the experience of children who had to migrate for their safety and well-being. This is a mix of picture books and novels; some are better for younger children (ages 5-8) while others are suited for older children (ages 9-10). 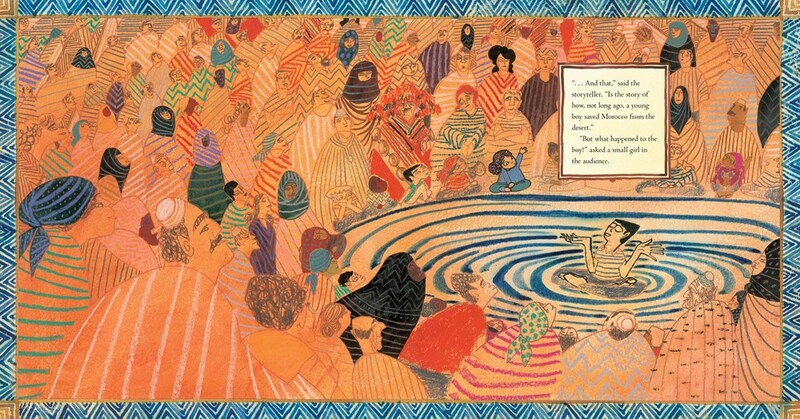 Migrant: The Journey of a Mexican Worker, by Jose Manuel Mateo -- powerful picture book for older readers, telling the story of a boy who immigrates to the United States. 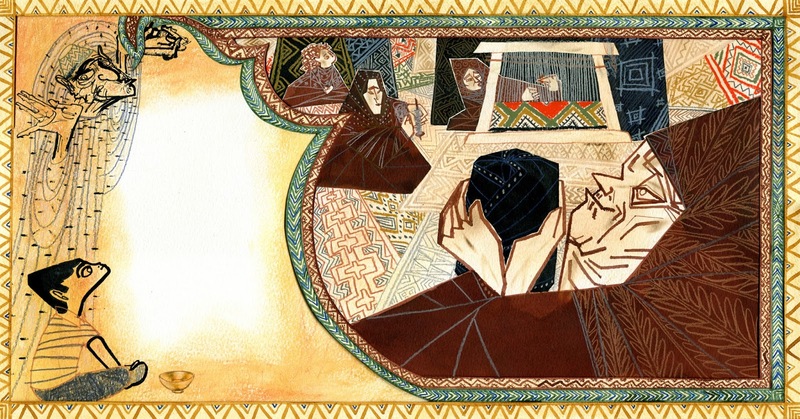 One long illustration folds out, reminiscent of ancient Mexican codices. Thank you for sharing and standing strong. We must use our voices to say that all are welcome. We will not stand for rules that discriminate immigration policies based on religion or race. We will not separate families. We will protect our students. If you make a purchase using the Amazon links on this site, a small portion goes to Great Kid Books. Thank you for your support. It has been so exciting to see the excitement building across Berkeley. We are having our final Mock Newbery meetings at each of our 11 schools. Every school has a group of excited, enthusiastic kids, with 30 - 65 students coming during lunchtime to talk about the best books of the year. 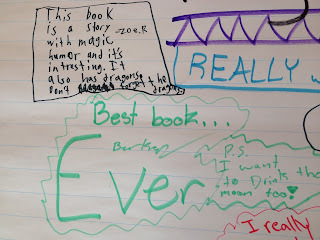 They are having engaging, thoughtful discussions as they consider what makes an outstanding book. The 2017 Newbery Committee, 15 librarians from across the country, starts its meetings today in Atlanta. They'll deliberate and consider these and many many more books -- carefully talking about what makes a distinguished book for children. Join the excitement, and watch their announcement on Monday morning: The awards will be live streamed from the I Love Libraries Facebook page. I am so grateful for the support from all of my colleagues in Berkeley. Together, we are making a huge difference in kids' lives. Many many many thanks. Young students throughout Berkeley march each year in honor of Martin Luther King, Jr., leaving campus and walking through the community holding signs proclaiming "Peace" "Love" and "I have a dream of equality." Alongside biographies of MLK, we study other figures who stand up for their values. 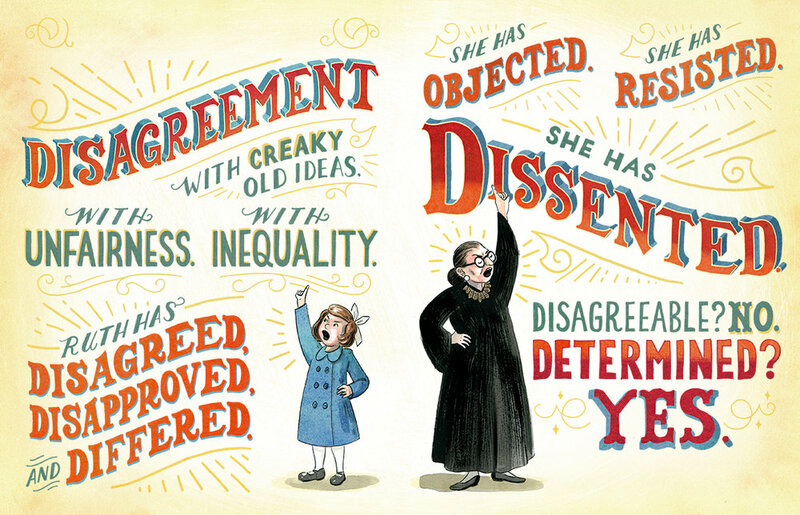 A favorite new picture book is I Dissent: Ruth Bader Ginsburg Makes Her Mark -- it is a perfect way to honor this day of service, this day of protest. Throughout her life, Ruth Bader Ginsburg has fought for the things she cares about, pushing back against bias, racism, sexism. This is a timely book to share with children, that will lead to many conversations about how we can protest for the things we believe in. 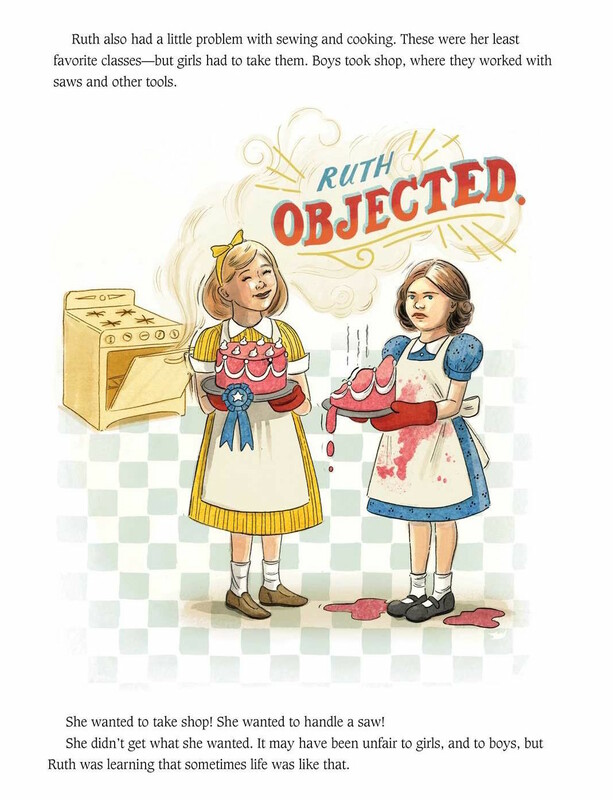 "She has objected. She has resisted. She has dissented. 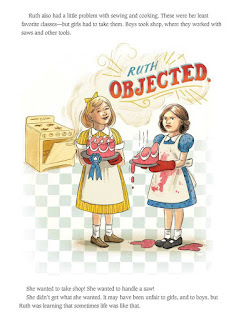 Ruth was learning that sometimes life was like that." 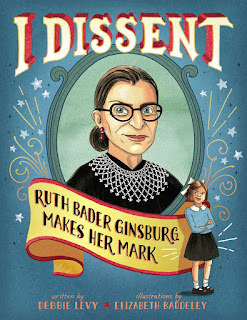 Young readers notice how Ginsburg draws strength from her personal struggles and how she has felt the sting of prejudice herself. Ginsburg was pushed to write with her right hand, even though she was left-handed. She was required to take sewing and cooking classes, even though she wanted to take shop. She noticed signs that excluded Jews and blacks, and realized how unfair those practices were. I especially love the interplay between words, pictures and story in this picture book biography. Kids love passionately declaring their positions, and Levy uses powerful, stirring action words: objected, resisted, protested, persisted. 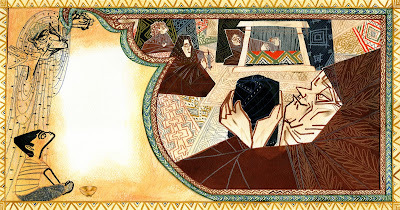 Baddeley incorporates these into her illustrations with bold graphic design. Levy ends this biography with a look at Ginsburg's work serving on the Supreme Court, standing up for "fairness and equality." Above all else, Ruth Bader Ginsburg shows how disagreeing with others in a logical, well-reasoned, persistent way can help change minds. I Dissent has been awarded the 2017 Sydney Taylor Book Award by the Association of Jewish Libraries. 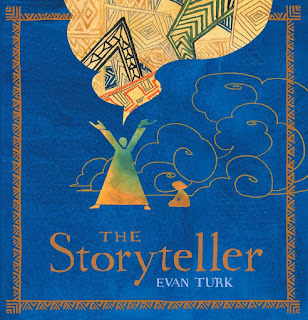 This is one of the best picture book biographies I have read this year. The review copy was kindly sent by the publishers, Simon & Schuster. If you make a purchase using the Amazon links on this site, a small portion goes to Great Kid Books. Thank you for your support. 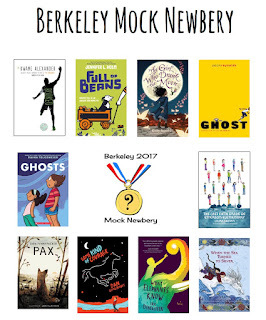 I'm so excited that kids in Berkeley have loved joining our Mock Newbery book clubs. We've started one in every elementary school in Berkeley, with 50 kids are joining at each school. That means we've got close to 500 kids reading the best books published this year, building community and spreading book buzz! 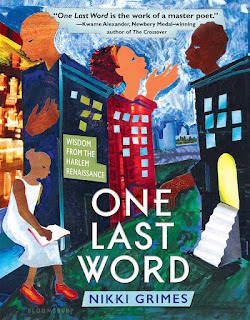 In their special issue leading up to the ALA Awards, Publishers Weekly (PDF version here) highlighted three mock Newbery programs across the US. They wrote about how this award, like the Grammys and Oscars, makes headlines and creates bestsellers -- and how our students are "in the thick of it," predicting and analyzing potential winners. I just love the way that Shannon Maughan captured the essence of our project. It has been amazing to watch the response at each elementary in Berkeley. Kids love getting to choose to join a book club, getting to choose which of the nominated books to read. Parents are telling principals that their kids are reading more than ever. 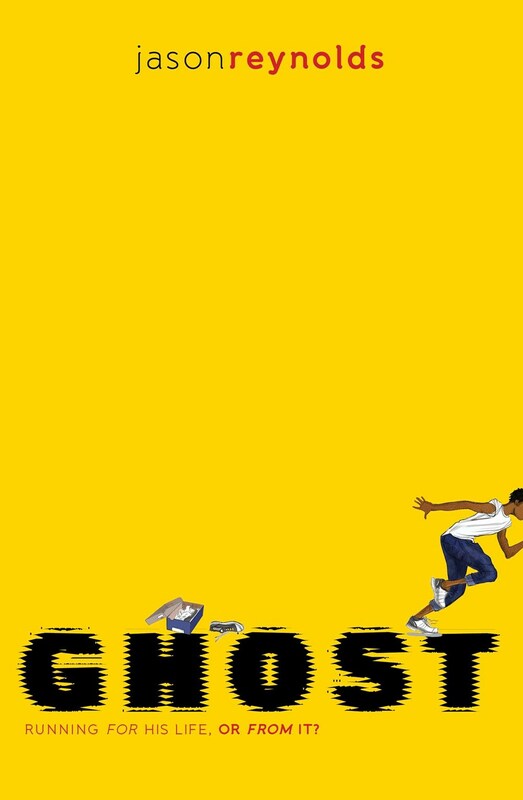 Librarians are noticing that these great books are circulating even more than popular mainstays like the Wimpy Kid. Even the principals across the district have formed their own book club, reading these books and sharing their thoughts with each other. Collaboration -- Every mock Newbery leader talked about partnerships within their schools and communities that help them launch these programs. Collaborators help figure out how to purchase enough books, help lead meetings, and help talk about which books to put on the final list. 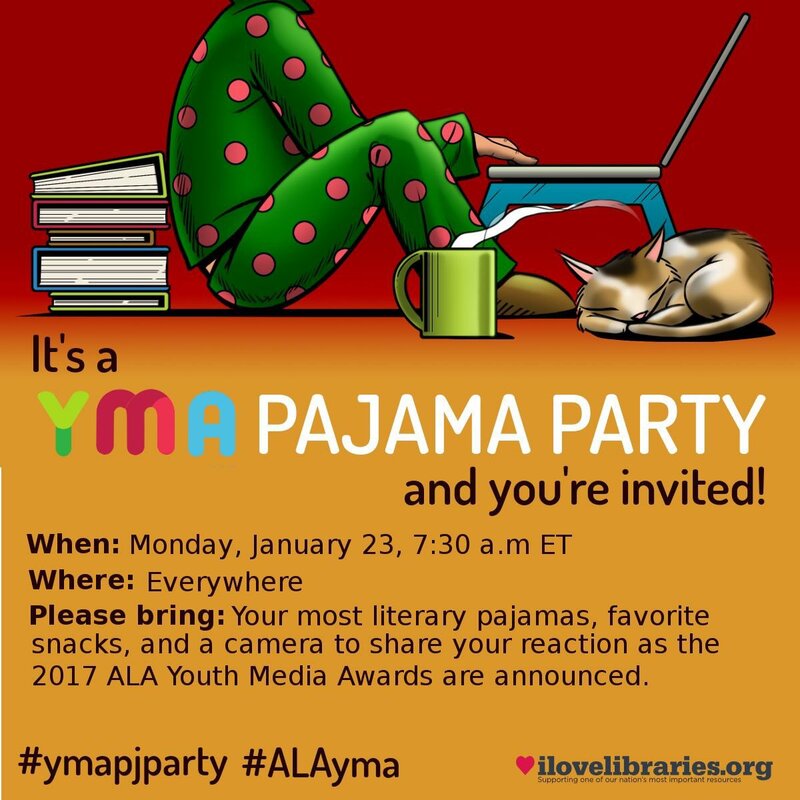 Social Media -- Teachers and librarians across the country are using social media to talk about books, whether it's through Goodreads, the #nerdybookclub, Twitter talks or NerdCamps. This has been a huge support to me. 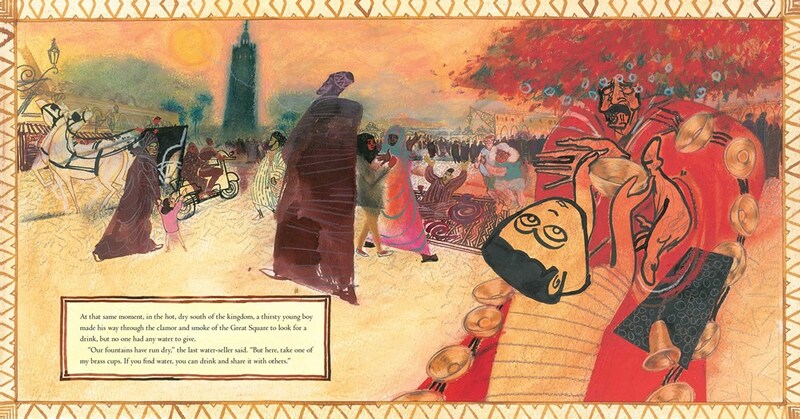 Inclusiveness -- Mock Newbery programs are especially powerful when they reach out to all students, especially those who are not yet confident readers. 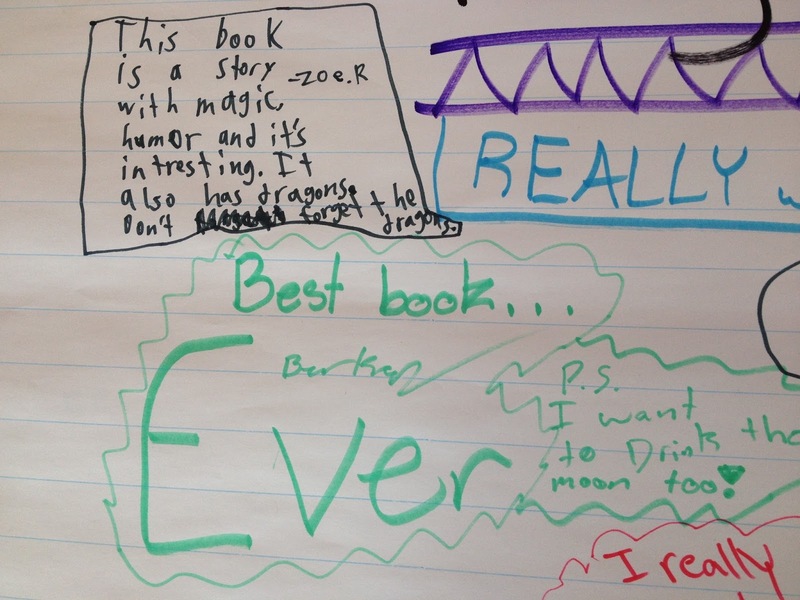 Spreading "book buzz" creates excitement for all readers, and this engagement is a huge piece of increasing students' reading abilities and enjoyment. 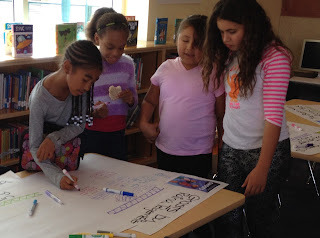 Early Planning -- All of us start the year promoting our mock Newbery book clubs. This helps build excitement, and it enables kids to read enough books so that they're familiar with the best of the year by the time the January Newbery announcements come out. "Best book ever!! PS: I want to drink the moon too!" I want to honor and thank Berkeley's terrific district library coordinator, Becca Todd. We have had so much fun creating this project together. I am so grateful that Armin Arethna, Berkeley Public Library children's librarian, has been my teammate all through this project. 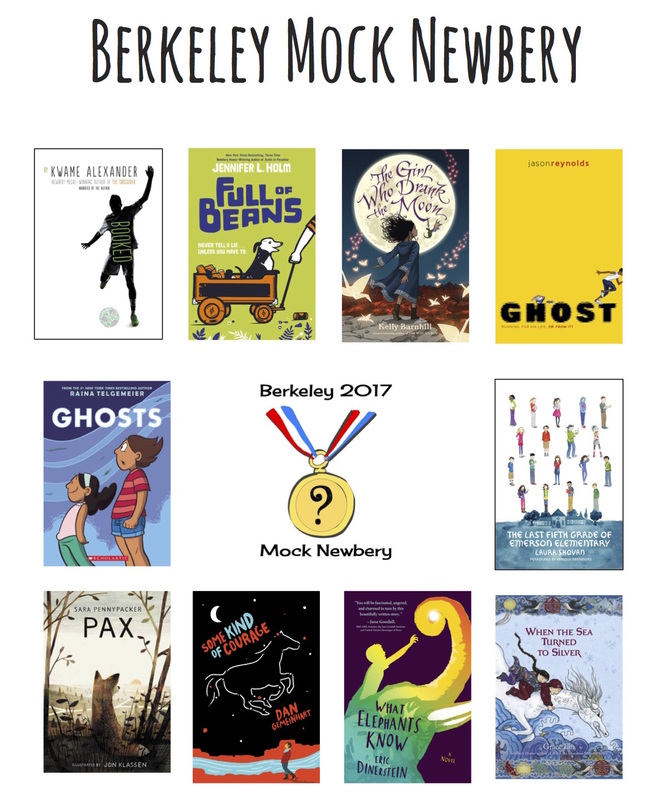 And most of all, I want to honor and thank all of the librarians, literacy coaches, teachers and principals who have helped spread this book buzz throughout the kids of Berkeley.